In recent years, after disintegration of the Soviet Union the relatively new geopolitical term ‘Central Eurasia’, has gained popularity. The term Central Eurasia is normally applied to Azerbaijan, Armenia, Georgia, Kazakhstan, Kyrgyzstan, Tajikistan, Turkmenistan, and Uzbekistan, which are treated as a single geopolitical area. However, the logic suggests that if the physical dimensions of the continent’s parts are put aside, then the geographic Eurasia as a continent consists of Europe and Asia. The geographic Central Eurasia almost completely covers geographic Central Asia and the Caucasus. The strategically located resource-rich region shot into prominence mainly after the collapse of the Soviet Union when these states became independent sovereign states. Radical Islamist extremist activities emanating from the region also ensured the region was in global spotlight, specially after 9/11 attacks. Of late, Central Eurasia is occupying an increasingly crucial place in the international power politics. Members of the Commonwealth of Independent States (CIS), these nations are at varying stages of political or economic development. Some are vibrant democracies whereas others are still following centralized regimes. In the early twentieth century, Britain’s geopolitical theorist Halford J. Mackinder called Central Eurasia the Eurasian ‘Heartland’ to highlight the region’s geopolitical and geo-strategic importance in global politics. Mackinder opined that the one who would control this region would also control the whole world. Indeed, with the end of the Cold War and disintegration of the Soviet Union, Central Eurasia has developed as an important geo-strategic and geo-economic region in world politics. Central Eurasia, however, suffers from localized conflicts as well as economic distress. Ethnic tensions continue in many of these states, making the region susceptible to instability and threatening its political and economic development. Its location between, Russia, China, Iran, Turkey, and Afghanistan make the region a focal point for foreign powers as well as potential conflict between them. The US, EU, China, Japan, Pakistan, Saudi Arabia, and Israel are all interested in the region. It can thus be said that the region is at the centre of a new ‘Great Game.’ However, unlike the Great Game of the 19th century, which was played out between the British Empire and the Czarist Russia, the post-Cold War 'Great Game' in Central Eurasia involves not only states but also non-state actors, international organizations and transnational oil corporations (TNOCs) etc. Active in the region in military security terms is the US and NATO. NATO also runs military programmes in Central Eurasian states in the context of the Partnership for Peace Programme (PfP). The Organization for Security and Cooperation in Europe (OSCE) is also active in the region. The Shanghai Cooperation Organisation (SCO) is becoming an important player. The SCO includes Russia, China, Kazakhstan, Kyrgyzstan, Tajikistan, and Uzbekistan as main members of the organization and India, Pakistan, Mongolia and Iran as observer states. India will shortly become a member of the organization. The SCO's agenda is based mainly on economic cooperation, but is also working towards curbing drugs trafficking and terrorist activities in the region focusing on the security concerns of the region. The Russian factor is still very strong in the Central Eurasian States politico-economic as well as in the energy sectors. Driven by India's security and increasing energy needs, India enjoys a high profile in Central Eurasian region because of its long-standing special relationship with the erstwhile Soviet Union and its links with Central Eurasia in terms of security and trade. States of Central Eurasia are also keen to develop close relationship with India due to India’s economic growth and geopolitical influence. The Central Eurasian region’s oil and gas reserves could be a major contributor to socio-economic development and transition of the region. The Caspian littoral states (Azerbaijan, Kazakhstan, and Turkmenistan) together with Russia and Iran have one of the world’s largest oil and gas reserves, which makes them important players in the global market. Estimates of proven and possible oil reserves across the whole Caspian area, excluding Russia and Iran, amount to 190 billion barrels of oil. Its proven gas reserves are estimated at 196 trillion cubic feet. The proposed Turkmenistan-Afghanistan-Pakistan-India gas pipeline, being developed by the Asian Development Bank, will transport the Caspian Sea’s natural gas from Turkmenistan through Afghanistan into Pakistan and then to India. The Indian government has approved inter-governmental agreement and Gas Pipeline Framework Agreement for TAPI pipeline project at a summit meeting of the four participating nations at Ashgabat to import natural gas through TAPI pipeline on December 11, 2010. Turkmenistan will supply gas from its South Yoloten-Osman field and state-owned gas utility GAIL India has entered into a Gas Sales and Purchase Agreement (GSPA) with Turkmenistan’s national oil firm Turkmengaz during the Summit in Ashgabat. 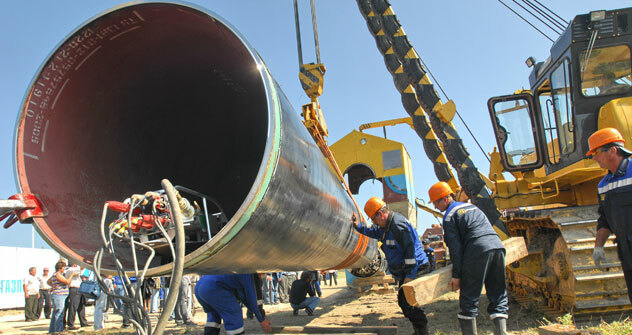 Another significant pipeline connection of the region is the Baku-Tibilisi-Ceyhan (BTC) pipeline. These pipelines can become a major energy resource for India. But the political situation in these countries might make their smooth operation difficult. Central Eurasian states are particularly sensitive to security problems, as they lack the experience that comes from independent statehood. They have not had the opportunity to develop a defined culture for strategic and security planning or for policy engineering. Furthermore, these newly independent states tend to underestimate certain security threats, exaggerate others and sometimes even overlook vital factors in national security planning. Their strategic visions and calculations are mainly based on historical events with reference to ethnic lines. Scenarios for Central Eurasia have been developed here to stimulate questions, widen perspectives and explore uncertain aspects of the future of the region. Future Scenarios might also help to seize new opportunities as well as avoid undesirable effects of misconceived actions in the region. Here are ten possible scenarios. Scenario 1: A critical driver of change in Central Eurasia will be the region’s economy. The most important economic issue will be to shift from resource dependence to economic diversification. It is expected that by 2020, resource extraction will remain as an important part of Central Eurasia’s economy. Scenario 2: The failure to diversify Central Eurasia’s economy could lead to the ‘petro-state phenomenon,’ which will increase huge income inequality, capital flight and social tensions. In this context, economic development and growth through 2020 are integrally interlinked with effective governance structures. This refers not so much to liberal democracy but to an efficient bureaucracy, predictable and evenly enforced rules and regulations, the rule of law and other factors such as tax policies that can stabilize the business climate in the country and allow for an alternative to resource-dependent economic growth. Reforms in these areas can encourage foreign direct investment outside the energy sector and allow Central Eurasian States to take greater advantage of the regions proximity to the Europe and Asia. Scenario 3: These states are getting closer to each other, a trend that may encourage their peaceful coexistence. At the same time, some countries (in the Caucasus and Central Asia) might improve their living standards, while in others the living standards might deteriorate. Scenario 4: Countries of Central Asia are likely to be challenged by the twin pressures of growing population and a lack of arable land and water resources. The economic and demographic challenges can negatively impact the environment, compounding the current degradation caused by the high rates of ‘dirty’ resource extraction. Scenario 5: For countries with limited supplies of natural resources like Georgia, Kyrgyzstan, Tajikistan and Uzbekistan, the challenge will be to develop effective service industries. Scenario 6: Ethnic unrest would continue to cause disturbance in the region. Economic difficulties could exacerbate ethnic and religious tensions further. Scenario 7: There is also the potential for aggressive nationalist politicians using anti-Western rhetoric which will sharpen tensions with Europe and the United States. Scenario 8: Central Eurasia’s relations with China could deepen due to Chinese migration as well as due to China’s huge funding capabilities. Scenario 9: China might serve as a strong counterweight to Russia and the US, particularly in Central Asia. It could also ally with the US and Russia in a bid to quell tensions that occurs due to radical Islamic activities. It is more likely that Beijing and Moscow will bury their differences in the region and will form a powerful alignment. Scenario 10: It is expected that the West will continue to pursue self-centered foreign policy objectives in the region. Central Eurasia and India can improve relationship with each other in the politico-economic and security sectors through regular interaction at the higher-decision making levels. India and Central Eurasian States should work closely with each other as the three CAR’s (Central Asian Regions) bordering Afghanistan i.e. Uzbekistan, Tajikistan and Kazakhstan can curb security threats emanating from Afghanistan. India and Central Eurasia should revive the Silk Route traditions to improve their trade and economic cooperation. India can develop close contacts with the multilateral organizations in the region. The two sides can formulate strong energy policy as this region has got the potential to emerge an important pillar of New Delhi's energy's security. India can bury differences with Beijing in Central Asia to form a powerful alignment in the region. Central Eurasian states can look for ways to take advantage in certain areas of India’s science and technology sector, which would help to enhance their economic profile to grow beyond natural resources. India can revive strong civilizational links with the Caspian Sea region by leveraging India’s soft power to get closer to the region. However, there is a need to look for ways to increase people-to-people contacts and step up information sharing. Dr. Nivedita Das Kundu is a Foreign Policy Analyst, presently working with the Indian Council for Social Science Research, New Delhi.